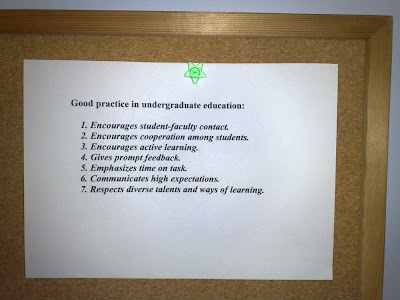 Twenty-two years ago, well before we were using the internet for teaching and learning, Arthur Chickering and Zelda Gamson compiled a list of Seven Principles for Good Practice in Undergraduate Education. A copy of this list lived on the corkboard above my desk for the first few years that I was teaching. Although the corkboard is long gone, the list is still as important to me now as it was back then. Over the next few weeks, I'll be discussing how these seven principles are still relevant today, and how Web 2.0 applications embedded into our teaching can help us to improve the outcomes for our students.